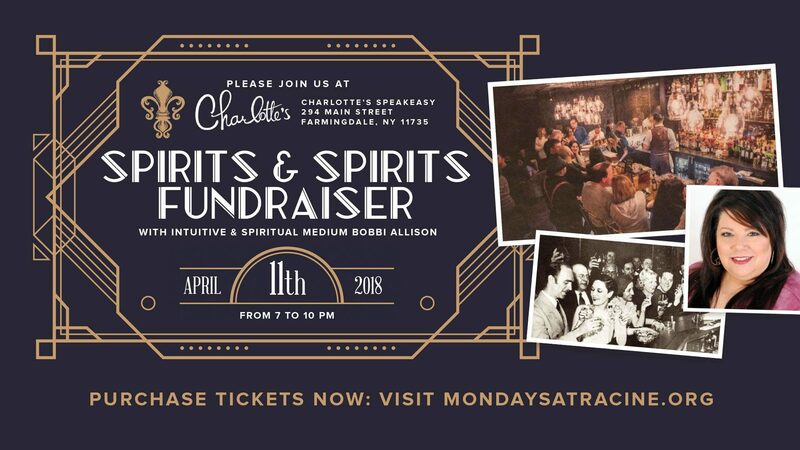 Join us for an evening of psychic readings from a 1920’s speakeasy where the spirits flowed, the music played and patrons came together to escape everyday life and have a little fun! On Wednesday, April 11th at Charlotte’s Speakeasy, in Farmingdale, renowned Intuitive & Spirit Medium Bobbi Allison will do what she does best…a gallery style reading, looking for messages from those that have passed on. Seen on Dr. Oz and in Goop’s Guide to Energy Healers, Intuitives Spiritual Healing & Messages, you can learn more about Bobbi at www.bobbiallison.com. Proceeds from the event will benefit Mondays At Racine. *Please note: There is no guarantee you will receive a personal reading in a group setting.